No Republican has ever — ever — won 270 electoral votes without winning Ohio. Look at all the Republican presidents in history and they have one thing in common: They won Ohio. The losers didn’t. So Ohio is an especially important state to the Republican presidential nominee. You need the Ohio GOP team to be 100 percent excited about your candidacy. A simple way to “wine and dine” the delegates — the top fundraisers, activists and elected officials in the Ohio Republican Party — is to treat them special on the floor of the national convention. Like any other big event, where you’re seated matters. 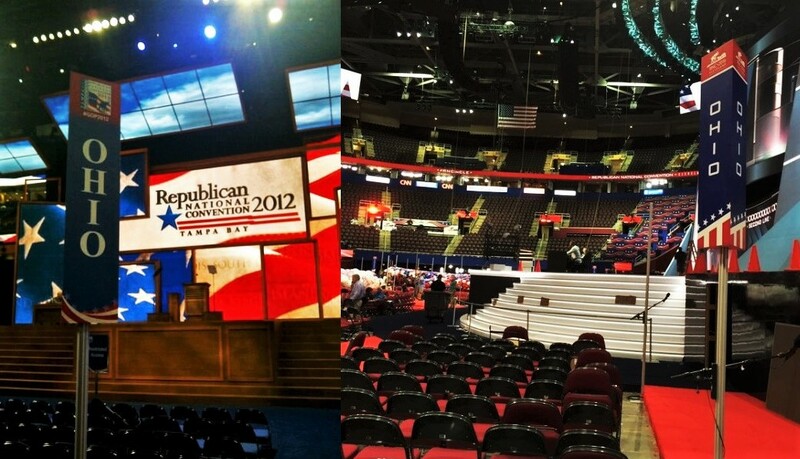 Standing front and center where the Ohio delegates were seated in Tampa in 2012. That’s why Mitt Romney put the Ohio delegation in the front row four years ago. Sure, he tried to tell me during an interview once that he had a backup strategy to win 270 electoral votes without Ohio. That didn’t work out so well for him. As the 2008 GOP nominee John McCain once told me, “there’s a reason why the eyes of the world are on Ohio on election night.” Whether you’re Lincoln, or Teddy, or Ike, or Reagan, you planted your flag in Ohio for the November election and worked out from there. But this year Ohio delegates arrived in Cleveland and discovered Donald Trump doesn’t care very much for them. After all, he lost the presidential primary back in March. Governor John Kasich has not endorsed him and probably will not. And many of the precinct level officials are, to put it politely, bemused by the billionaire reality TV host. So to punish them, Trump moved the must-win-state Ohio delegation from the center front row, to against the wall on the far left side, stuck behind the Pennsylvania delegation. The other front row seats are reserved for New York, New Jersey, California, Connecticut and (the only state of these Trump will actually win) Alabama. For the host state of Ohio it’s like going from the $500 floor seats to the $50. Or, so Trump can understand, it’s like having to declare bankruptcy and give up the world’s largest yacht for an aluminum fishing boat. Here’s a visual of how far Ohioans have fallen in four years. Above left, the center front row seats in Tampa. Above right the far left seats behind Pennsylvania in Cleveland. It’s clear from all this that the Trump campaign is eyeing Pennsylvania as a replacement for Ohio’s electoral votes. But that’s been tried before and is hardly a new strategy. And it’s never, ever worked. Sure, people from the other 49 states will say this is no big deal. But, let’s be honest here. When you really, really, really need a certain state to win the election, isn’t it a no-brainer to make sure the party activists from that state are really, really, really happy? The message Trump is sending Ohio Republicans is “I don’t need you, and don’t particularly want you.” We’ll see how that works out in November.